Brian’s Custom Pro Shop in Windsor is the premiere destination for hockey and figure skate sharpening in the Midwest and Southern Ontario. Joe Frei Jr has sharpened the skates of many of the best hockey players in the world. Ever go out on the ice after your skates have been freshly sharpened and feel like you can’t stop because your skates feel too sharp, and grab the ice so hard it feels like you are going to fall over? Or have they felt like you just slide and can’t grip the ice enough to stop and end up on the ice yourself? Or how about after a fresh sharpening, it feels like you blow a tire every time you turn to one direction? Do you usually feel like you have a “break in” time after your skates have been sharpened? 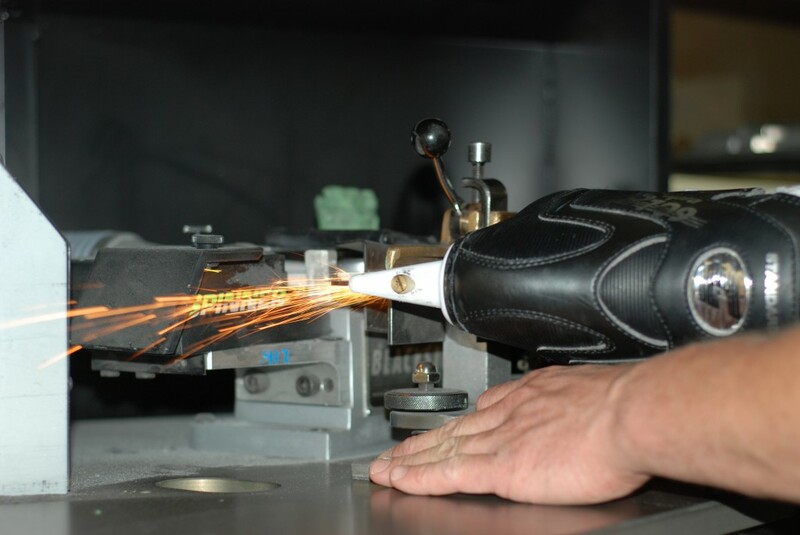 At Brian’s, we want our customers to know that they should never feel this after your skates have been sharpened accurately, and with the proper sharpening for your style of skating. Joe Frei Jr. has sharpened many elite hockey and figure skaters blades over the last 25+ years, and strives to make sure that there is always highly trained and capable staff on hand to sharpen your skates consistently if he is not available. We can do over 40 different hockey and figure skate sharpening’s, and a variety of profiles/blade shapes/rockers, and custom sharpen every pair of skates that come through, no matter what level of play or skating you are at. We want our customers to feel perfection every time they hit the ice, and it’s why we always ask for feedback to make sure that you are feeling what you want to feel when you hit the ice. Many of our customers will change their sharpening throughout the season, due to the constantly changing ice conditions, or different rinks they will be skating in. To us, we don’t take customers “complaints” as criticism, but as feedback to figuring what the right sharpening for them as an individual, and our goal is to find that optimal ROH (radius of hollow) or FBV (Flat Bottom V) sharpening that is right for you! So never hesitate to give us some feedback, it’s our job to make your skates are perfect! It’s what we love to do! Joe Frei Jr. has sharpened many elite figure skaters blades over the last 18 years.